It is easy to forget that only twenty five years ago the idea of a prime time animated series had not really garnered any long term success since The Flinstones and for my generation, that was before we were born. We only began to look at the series somewhat differently as we grew older ourselves. The Simpsons changed everything. Yet after The Simpsons there had never been a successful animated basic cable TV series as risky and funny as South Park. Without South Park, would we have Comedy Central giving Futurama a second breath of life with new seasons of new episodes? Could we see the borders of what you can suggest in a terrestrial broadcast pushed to their limit on Family Guy and beyond that on American Dad? I think we owe Matt Stone and Trey Parker a debt of thanks not only for producing a truly iconic animated sitcom, but for keeping it fresh after sixteen years and opening doorways for more and more animators to explore their art through various outlets like Adult Swim. There is nothing as funny as uncensored South Park on Blu-ray or DVD and from Comedy Central through Paramount Home Entertainment. All fourteen season sixteen episodes are presented in 1080p high definition with English Dolby TrueHD 5.1 Surround Sound as well as English Dolby Stereo Sound and English Subtitles for the Deaf and Hearing Impaired encoded as options for every episode on the two Blu-ray Discs. 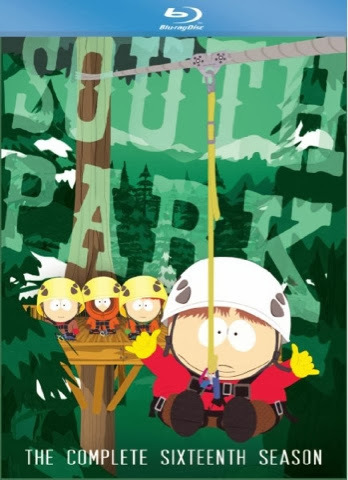 Deleted scenes and mini commentary tracks by Matt Stone and Trey Parker are provided for all fourteen episodes within the two-disc set. South Park: The Complete Sixteenth Season on Blu-ray Disc is available now at retailers on and offline courtesy of Comedy Central and Paramount Home Entertainment.